(ecological zone) and offers an unrivalled range of climates, landscapes and cultures. The province is the second largest in South Africa and represents 14% of the country’s land mass. The area has miles of sandy beaches, a variety of nature reserves and quaint towns filled with rich histories and vibrant cultures. It is these distinctive attributes that attract local and international tourist to the province. The automotive industry is one of the main contributors to the area’s economic growth. The Eastern Cape is home to three major automotive manufacturers, namely Volkswagen, General Motors South Africa (both located in Nelson Mandela Bay), and Daimler Chrysler (situated in East London). In addition, there are over a 150 vehicle component manufacturers in the province. Infrastructural projects such as the Coega IDZ (See Nelson Mandela Bay general information) and the East London IDZ have shown added value to local and foreign investors with export interests. Nelson Mandela Bay, covering an area of 1950 km², is situated on the east coast of South Africa, in the Eastern Cape Province. It lies midway between Cape Town and Durban and 1058 km from Johannesburg. 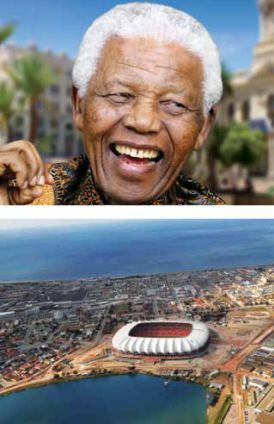 Nelson Mandela Bay is named after former South African president, freedom fighter, and Nobel Peace Prize winner, Nelson Rolihlahla Mandela. 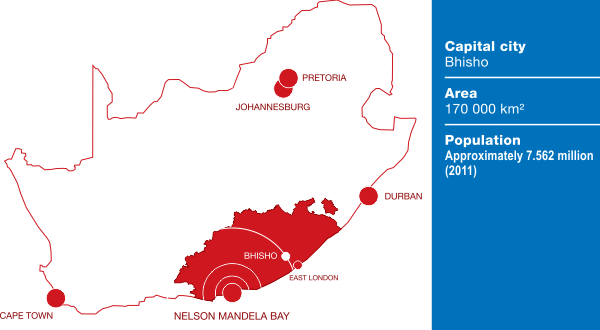 The Bay is comprised of Port Elizabeth, Uitenhage and Dispatch, with Port Elizabeth being the largest city in the Eastern Cape. Nelson Mandela Bay boasts an assortment of tourist attractions such as its clean, safe, golden beaches and its exquisite natural surroundings and wildlife reserves. Situated on the outskirts of Port Elizabeth (25 km west from the city centre), one would find the ever popular Seaview Game and Lion Park. The ADDO Elephant National Park, home to the Big 7 and to the world’s most comprehensively recorded elephant population, is situated 72 km north of Nelson Mandela Bay. The Bay also presents a diverse marine life that can be enjoyed all year round. The area’s vibrant and friendly culture offers visitors diversity, from the indigenous Xhosa culture with its unique and charming craft, music and dance to the European Colonial history showcased in various museums and architecture in the area. A range of art galleries in Nelson Mandela Bay exhibit local artists and open-air flea markets pose the opportunity for crafters to display and sell their work. Warm, dry summers and mild winter temperatures. Superb sailing venues, first-rate scuba diving with colourful coral species, beautiful reefs and shipwrecks, near perfect conditions for wind-surfing, angling, snorkelling, kite-surfing, fly-fishing and canoeing. Excellent schools, universities, hospitals, good telecommunications infrastructure and modern shopping centres. Unspoilt beaches and rivers and countless malaria-free game and nature reserves (free of hippopotamus and crocodile) to explore. Hiking, 4X4 trailing, white water rafting and bungee jumping activities. Beautiful parks and botanical gardens with an abundance of bird life.